This powerful but easy-to-use, fully Windows driven software system is your opportunity to make calculating and printing all of your forms and contracts and keeping track of your inventory and customer (and potential customers) an easy task! Have accurate access to your entire inventory and customer base at the tip of your fingers. Easily calculate and compare up to four different deal options on one screen! Check out more of the features of The Dealership Tracker™ by clicking on a menu option on the left including some of the new features just added. Also check out our news about the future of The Dealership Tracker™. 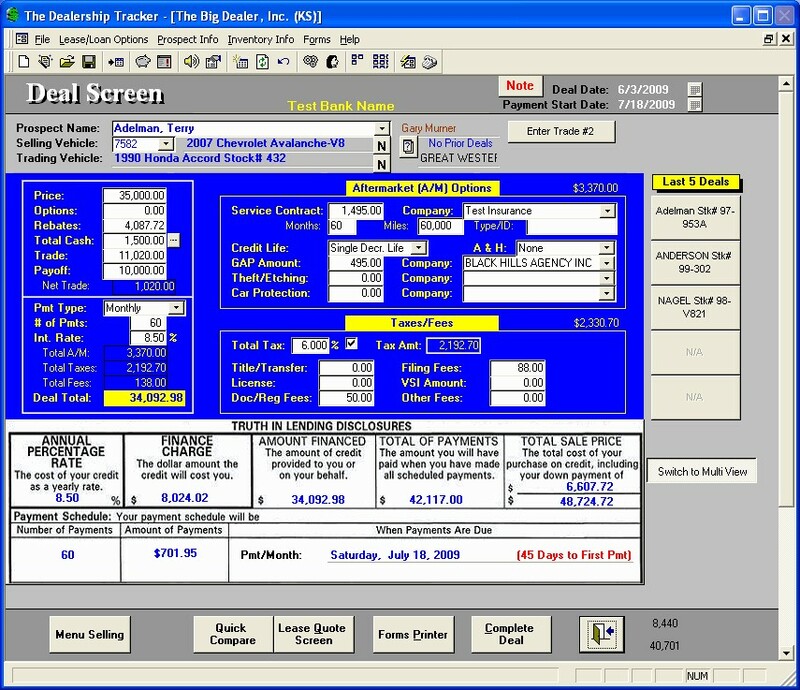 An online video demonstration of The Dealership Tracker™ and the Menu Selling system is also available. Just click here to see a great overview of these systems and how they can work for you. You also have access to a complete Menu Selling System that is directly integrated within The Dealership Tracker™ F&I system or can be used as a stand-alone menu selling system. Would you like a free personalized web demo of this system? We would be glad to set up a personalized web demonstration of our system to show you how the system can work for you and your dealership/company.